DAY 12: Product Catalog Pages – How Strategic Is Yours? 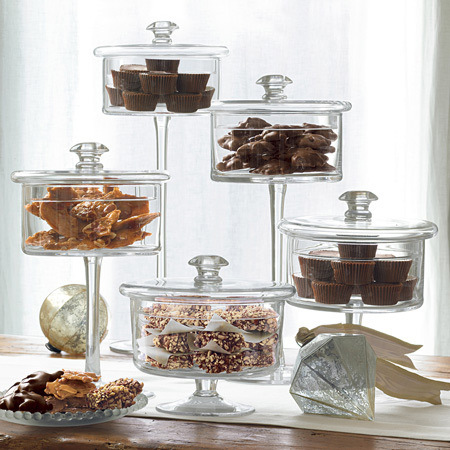 Consumers can make better sense of your offerings when you group them. Hands down, the topic of persuasion architecture in online catalogs is… my favorite. It’s pretty fascinating to think that you can design information/content in a high-stimuli page to persuade more users to click on products that are actually better suited for them. What’s even more fascinating is that so few companies actually seem to be designing their catalogues with even basic persuasion principles in mind. Here are a few examples of what seem to be haphazardly organized default product catalog pages — with complete apologies if I’ve dissed your catalog design (please comment to tell me how wrong I am! 🙂 ). Catalog pages that show opportunities for persuasion architecture. Each of these 3 catalogs presents a lot of information for the user to sort through. That’s asking the user to do work. Not good. To give the above page designs the benefit of the doubt, could we assume that these etailers are simply counting on users to use their sorting capabilities to create for themselves a better shopping experience on the catalog? — and that’s why they’ve done very little with the default catalog? Even if that is the case, the question still remains as to why the default catalog is not organized in a meaningful, persuasive way, given that users will spend time on it before sorting. So, what can make a catalog page more persuasive? And what might a more persuasively architected catalog page look like? Let’s discuss. It’s ideal to exert as little effort as possible to make the most accurate choice for you. Users online want that — especially, research has shown, when they’re shopping for utility rather than for pleasure. Consumers have well-developed methods of trying to make sense of a lot of information — one of those methods is leveraging social proof, and another is choice simplification via relational comparisons. All summed up, it’s called the Context Effect. And it can be your closest ally in designing a catalog page. Why, you ask? Well, in 1992, Simonson and Tversky showed that consumers determine the value of an option by focusing on it in relation to other items in a “choice set” (or a grouping of items). Context Effect shows that, in decision-making environments, consumers make relational comparisons between options. They scan the information they see to start comparing and making sense of everything. They look at the bullet points of a product description and begin making trade-offs between the one list of bullet points and another list on the page. Rather than standing back and looking at the environment and its information from a ‘global’ perspective, consumers go local — they focus in on certain product attributes in relation to the attributes of another product and make decisions accordingly. This information is a bit different from a persistent assumption that people look at objective facts in making ‘rational’ purchasing decisions. Case in point: Buying insoles is a decidedly non-emotional purchasing decision, but do you think you’d be able to look at the insole catalog above and not start sorting the information by eliminating certain items and contrasting others? How else would you make sense of it all? So the point is that consumers make relational comparisons between options rather than making absolute assessments. What can we, as catalog designers, do with that? If people need choice sets to begin making better relational comparisons, let’s give those sets to them. To develop choice sets, just begin by looking at the products in your catalog to see which are most similar; the ones that have the most in common become natural choice sets because they may make it easier for users to compare. The goal is to help users compare and, if possible, to make the best products actually look like the best products by showing that, compared to other products, they’re just numero uno. Now here’s an example of a default catalog page that feels like it could benefit from the Context Effect. 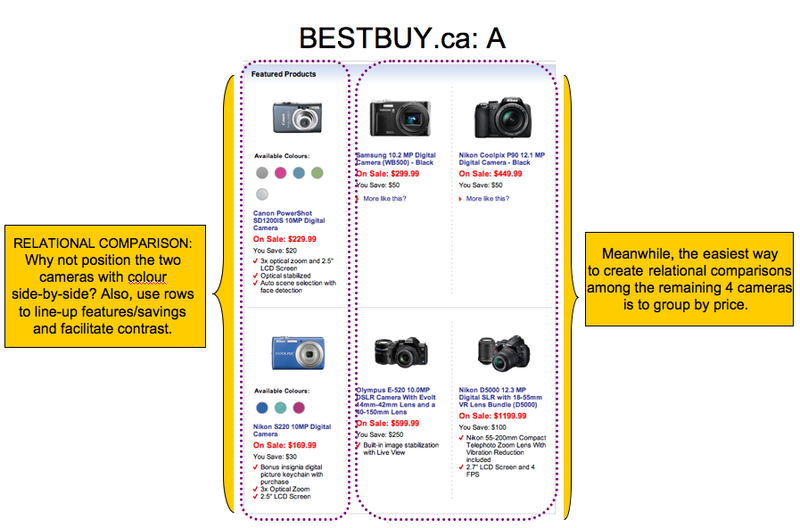 Generally speaking, “BestBuy.ca B” lines up all camera images, product names, prices, savings/discounts and feature lists to facilitate ease of comparisons in choice sets. It also creates choice sets by grouping similar cameras to help users who are looking for a certain camera attribute or shopping with a budget in mind to easily find the cameras they want and eliminate the ones they don’t. 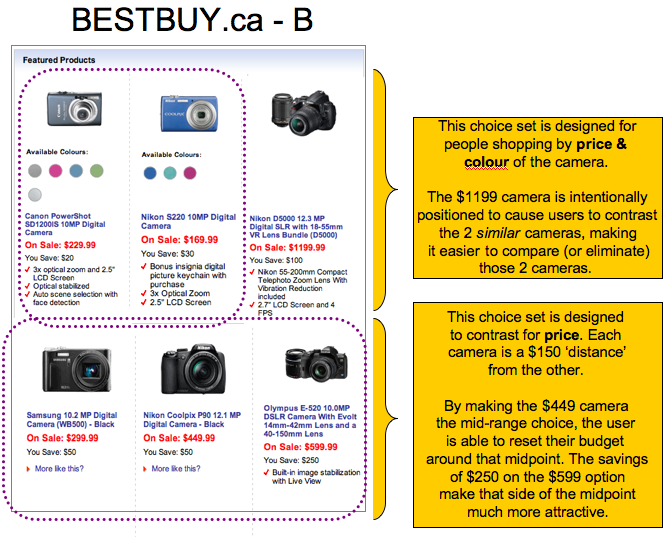 Finally, the use of whitespace on the $1199 camera shows its lack of similarity to or relationship with the two ‘colour’ camera options, which can work to either eliminate it as an option for people who don’t have a $1200 budget OR to eliminate the two colour camera options for those who have a bigger budget. Nothing has changed except the grouping of the choice sets and the lining up of names, etc. In this example, there’s of course still some room to improve. For example, the huge savings on the $599 camera could absolutely be called out to persuade users; this is also an opportunity to contrast the $599 with the $1199 for those who might’ve been shopping with a $750+ budget. Another option is to pull the megapixels out into bullets so those can be better, more quickly compared. Context Effect helps users make sense of all the information you’d like to present to them… information that is otherwise overwhelming. All you need to do is sit down with your catalog, your product managers and your marketing team to figure out which products to group into choice sets and what attributes you’d like to line up to facilitate relational comparisons. And, by all means, test your newly architected catalog against the old one to see if Context Effect affects your users. Dhar, R., Nowlis, S., & Sherman, S. (2000, September). Trying hard or hardly trying: An analysis of context effects in choice. Journal of Consumer Psychology, 9(4), 189-200. Retrieved June 12, 2009, from Academic Search Complete database. « DAY 11: “Don’t Interrupt Me!” Can Interstitial Upsell Pages Persuade?